Whether in the pages of a glossy magazine or the window of a boutique florist, at some time you’ve spotted a gorgeous flower arrangement you’ve wished was sitting in your house. What stopped you, was it the price? Today I’ll show you how to create a stunning flower arrangement for less than half of what it would cost at your local florist shop! I’m using a mini-greenhouse terrarium purchased at Jo-Ann’s, but you can easily substitute any container. The tips I’m sharing are from my own experience working at a florist shop where I was responsible for creating all the FTD arrangements. I’ll start us off with a list of supplies in just a moment, but first let’s talk about flowers and greenery. A florist will often begin her arrangement by placing a fair amount of “filler” such as greenery or baby’s breath. This is done to cover the sight of the floral foam, take up space, and reduce the number of “showy” flowers used in the arrangement. The problem with this is that sometimes the “filler” can impede the desired placement of your main stems. Although you can simply pull out the filler to insert your flower, this can potentially leave holes in your foam, which could expose your flower stems to air. For this reason, I usually begin with my flowers and insert filler at the finish. When choosing your flowers be sure to include various sizes and textures. You’ll want some single stem flowers (flowers with one long stem such as Carnations), some clusters (several blooms on one stem), some flowers that can “drape” (such as Freesia), and small flowers/greenery to tuck into any gaps. Here’s a tip for you—you might have all the “filler” greenery you need right in your own yard! Don’t be afraid to use trimmings from your own bushes. The general rule for creating an arrangement in proportion to your container is to have the flowers equal to the height of your container, and 1 1/2 times the width. So, if my container is 6” high x 4” deep x 10” long the flower arrangement should be about 6”-8” at the highest point and drape over the edges 1” front and back and 2” or 3” on each side. Ready to have some fun? 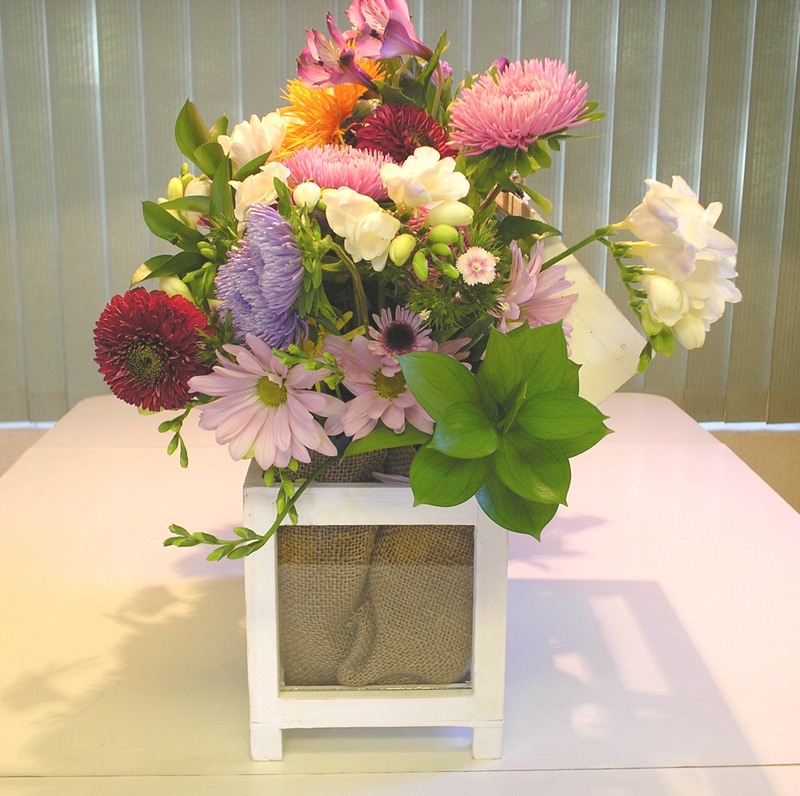 A bucket or vases to hold the flowers while working. Unwrap your flower bouquets, trim a bit off of the stems, and place them in a bucket or vases to allow the flowers to perk up after being compressed. This is a great time to use the little flower-food packets included in the wrapping. 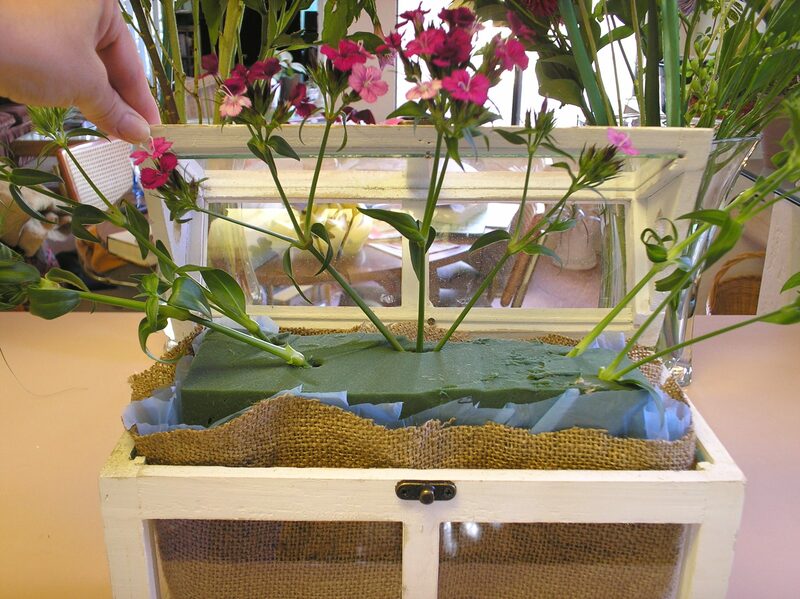 Soak the floral foam in a bucket of either plain water or water with flower food added. You can either measure the foam and trim prior to soaking, or trim it after it is fully wet. Once wet the foam is very easy to cut through. We are ready to create our arrangement. 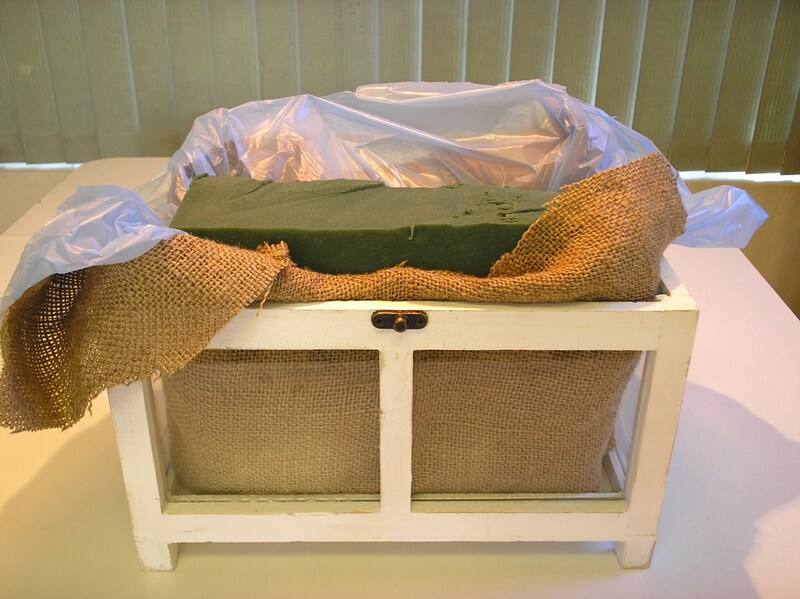 Since my container is glass, I’m going to start by placing some burlap in the greenhouse. Next, since my container isn’t watertight I’m adding a plastic bag. Now we can insert our floral foam. The floral foam is merely a tool for holding the flowers in place so it doesn’t have to fill the entire container. In fact, you want to leave room for the water. To keep your foam from shifting, you can either place florists tape across the top in a “+” pattern or simply cut a few small squares of foam to wedge in on the sides. Be sure your foam sits a bit higher than the container so you have someplace to insert the flowers around the sides—a couple inches is fine. Add a bit of water to keep your foam wet while you work. At this point I’m trimming away the excess burlap and plastic. The general rule for floral design is to keep the eye moving in a triangle. This rule can be bent depending on your container, but the key is to keep the eye moving from bottom to sides to top. This is done by using either the same flowers, flowers of the same color, or the same type of flower in similar colors. We’ll call these your main stems. In addition to your main stems, you might want to choose one or two large blooms as your focal point. 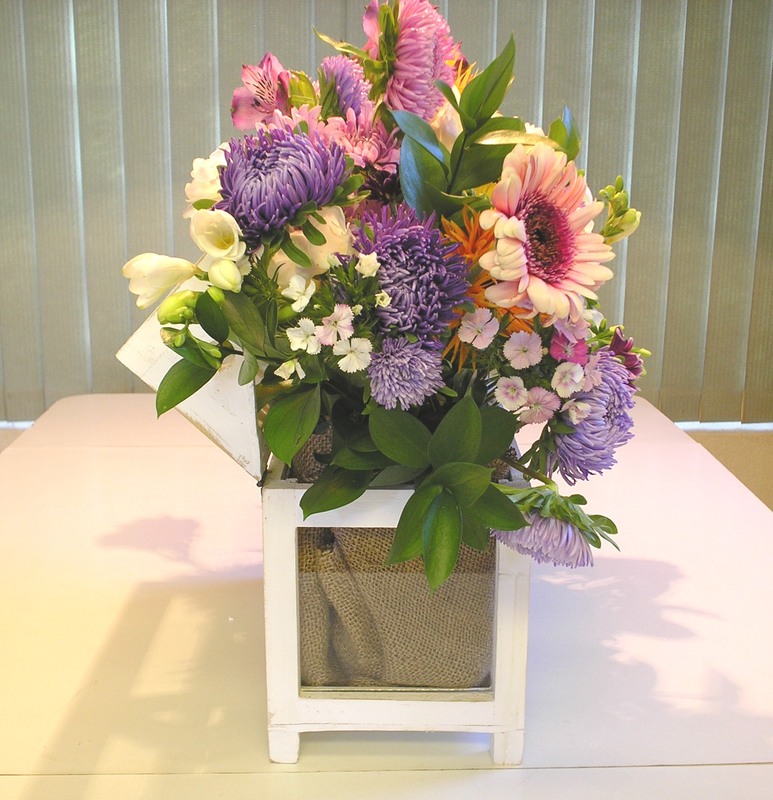 Large focal blooms are usually placed low in the arrangement or even resting on the rim of the container. The objective is to make the container part of the artistic expression; you don’t want it to look like your arrangement is floating above the pot. “Draping” flowers, such as Freesia, help to blend the container into the arrangement. Note: When using foam, flowers are trimmed and arranged just as they would be for use in a vase. You want your stems to reach to the bottom of the foam where the water is. Never enter your stems horizontally. Make your stems as long as possible. Let’s begin by using a few of our cluster stems to map out the proportions. At this time you can decide if there will be a back side to your arrangement. Place one tall cluster stem in the center (or the mid-back if your arrangement will be against the wall). Next, place stems of the same flower so they reach out to the edges of where your arrangement will end on all sides. The objective is to create the “bones” of your triangle. For those of you using a greenhouse like I am, our focus is mainly on the front of the arrangement. Since we plan on propping the lid up, let’s make sure the flowers in the back are placed far enough towards the center to be out of the way of the lid. Once you have an idea of the shape and size of your arrangement you can begin placing your main stems. It’s always more pleasing to the eye to have two or more of the same flower placed together. So, if you want the eye to follow purple mums, for instance, place two or three mums at each side and a few at the highest point. You might also place some at the mid points between these. Next, place your focal flower(s). I’m using a sunflower. A focal flower is usually set off-center. Now you can fill in with the other stems. Remember to place more than one stem of a kind together. Vary the heights of the flowers to create depth. 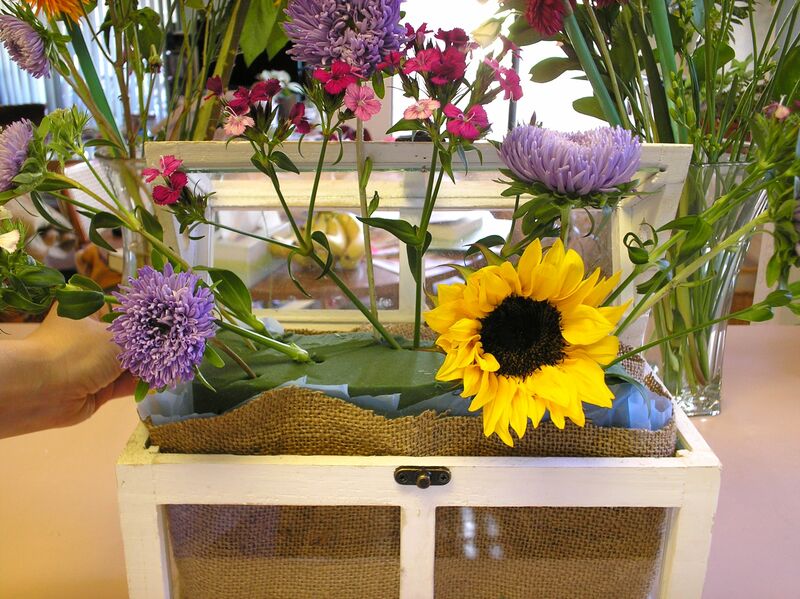 You’ll want to place the blooms so that they cover the stems of other flowers. This is especially true along the edges where you want the arrangement to blend with the container as a single artistic vision. Your arrangement is almost finished. At this time, let’s fill in any blanks with our filler and greenery. Basically, you’ll want to cover any place where you can see floral foam or stems. For those of you using a greenhouse, trim a few short pieces of greenery to cover the foam in the back. They should be short enough for the lid to clear the tops. We want anyone looking through the glass lid on the back of the arrangement to see plant material and not floral foam. At this point we can prop up our mini greenhouse lids. Thread one end of your twine through latch on the lower box and tie a knot. 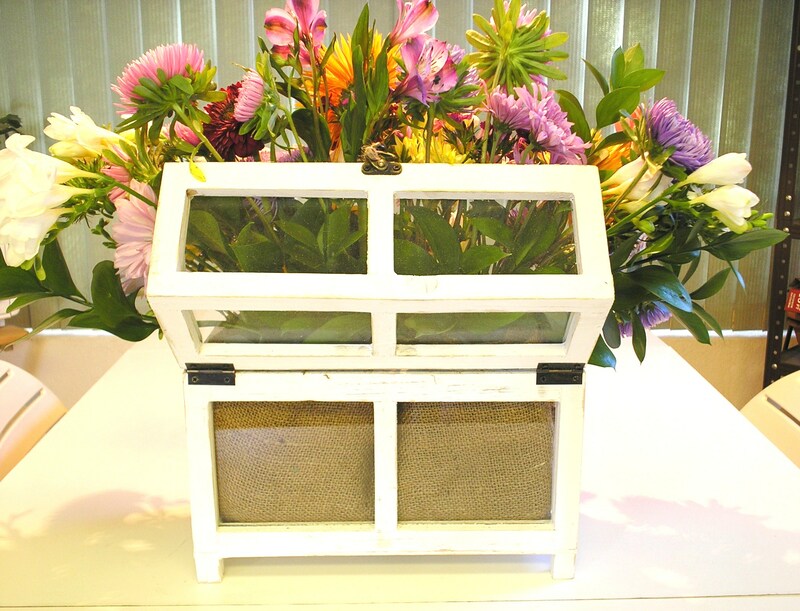 Pass the twine up through your flowers and tie it around the hook part of the latch on the lid. 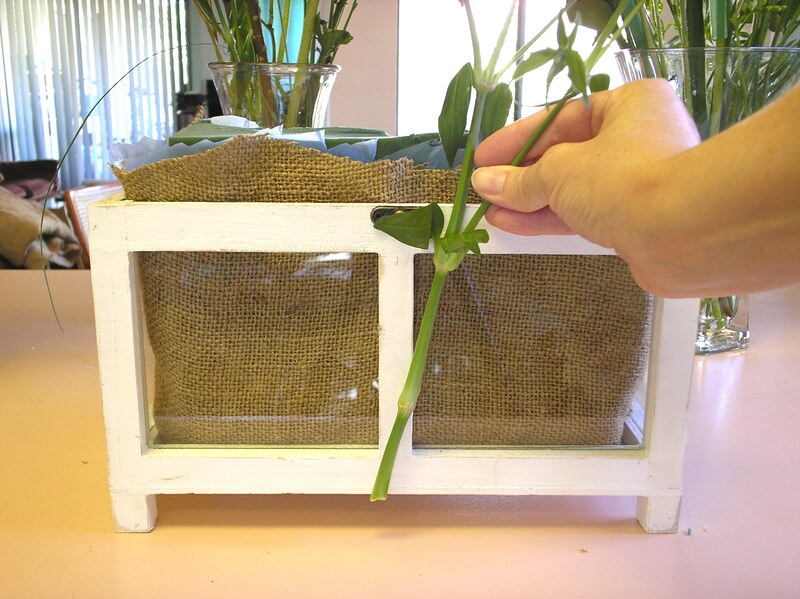 Continue to use your “filler” stems to conceal the twine. It’s so rewarding to make your own floral arrangements. First, it’s fun to watch your own skills increase. 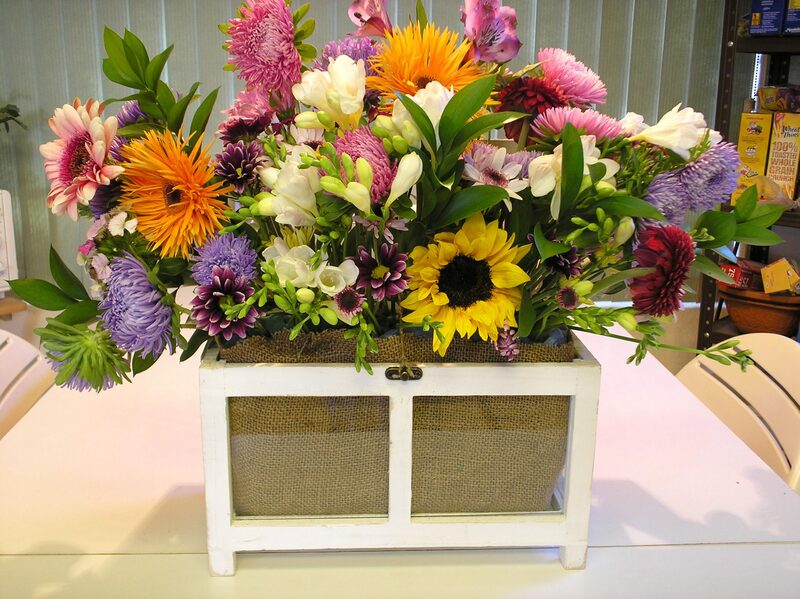 Your friends will absolutely love receiving arrangements you made yourself. And, you can finally decorate your home like those pictures in the glossy magazines–for less than half the cost of professional floral design! I worked the figures and determined that this arrangement would have cost $162.50 at the shop where I used to work—the DIY price was a mere $45.00.